It’s a week into the 2016 season, and the Nationals closer Jonathan Papelbon has looked good. But that most-important of baseball engineering marvels, the bridge to the closer, is far from concrete. The issue is that they have several decent setup man candidates, but no shoe-in. This shouldn’t be something to worry about, though. Instead, Dusty Baker and Mike Maddux could turn it into a real positive. With no setup man, they have the freedom to shape the end of each game as they see fit. Shawn Kelley is a strikeout pitcher, and his K/9 of 11.6 the last three seasons, coupled with a K/BB of 3.47, are what get people into late inning roles. But his velocity is down, his 90 mph fastball is about 2 mph slower than early April 2014 and 2015. He’s never been a real fireballer, though, and those swings-and-misses are off his slider (last year opponents whiffed on more than 20% of his sliders, less than 10% of his fastballs), so we’ll have to see how much it matters. 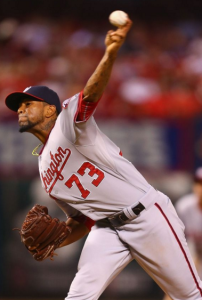 I don’t see much wrong with Felipe Rivero, but he’s young and he’s left-handed, and both scare people. I’ve seen concern about how he’ll handle late inning pressure. Without those chances, though, we’ll never know what he can do. Besides, I can think of another young setup man from the former Gran Columbia whose last name starts with River- … maybe that comparison doesn’t need to be made… youth isn’t an issue, is my point. As for his handedness, I’m not sure why we should care, because the batters don’t. In his short career, lefties have hit .202/.253/.247 against him, righties have managed .189/.250/.326. Righties stink against him, lefties just stink more. Then there’s Blake Treinen, who looks like a closer, with a 96 mph fastball and a devastating slider. He also has around a 10 mph differential on his changeup, which can be useful against lefties. But he’s struggled against them so far in his career, and he’s walked too many guys. With even a slight improvement in control, he’s the best option against righties. And if he can use the changeup more against lefties – which he didn’t do enough of last season – he could be good against them, too. In his second full year in the big leagues he has to show he can be trusted in high leverage situations. His ability would suggest he can, even in his disappointing 2015 he managed an ERA+ of 105. All of this choice, but no obvious answer, isn’t really a bad thing for the Nats. You’ve probably heard it before, but putting your best reliever at closer means you’re assuming that the ninth inning contains the most important outs of the game. But that’s not necessarily true. Likewise, the eighth inning doesn’t always contain the next most important out. Sometimes you’re up by two runs in the 7th inning, with two men on, and the other teams’ best hitter comes up. Chances are if you get through that, they’ll never have as good of a shot at winning. This allows them more flexibility to put their best relievers, other than Papelbon, at the highest leverage situations in the game. It also allows them to play matchups more. You’d be careful to put Treinen in for a lefty-heavy eighth inning, and, even though Kelley actually has reverse splits, Rivero would be the obvious choice. You can look at each pitcher’s strengths and try to match them with hitters’ weaknesses. And you can use Oliver Perez against a tough lefty in the eighth without a defined setup man pouting about his inning being stolen. It’s clear the Nats are taking advantage. On Monday, one potential setup man, Rivero, entered in the 7th. He stayed into the 8th to face lefty Freddie Freeman before another potential setup man, Treinen, came in. This couldn’t really happen this way if either of those two pitchers had a “defined” role. The same goes for Tuesday night’s pitching changes during the eighth and ninth innings. So, don’t think of it like the Nats don’t have a setup man. Instead they should do their best to avoid having one, and, if things go well, they could have three. And Baker will be able to use those three guys somewhat interchangeably depending on the matchup. If done right, this bullpen could be more effective than all but the best of the “traditional” ones we are so used to seeing these days.